1880s three brothers and their other. Tintype. Private Collection. No waistcoats on all four…Too hot for summertime. Digital restoration work titled 1880s Three Brothers And Their Other by Caroline C. Ryan is licensed under a Creative Commons Attribution-NonCommercial-NoDerivatives 4.0 International License. 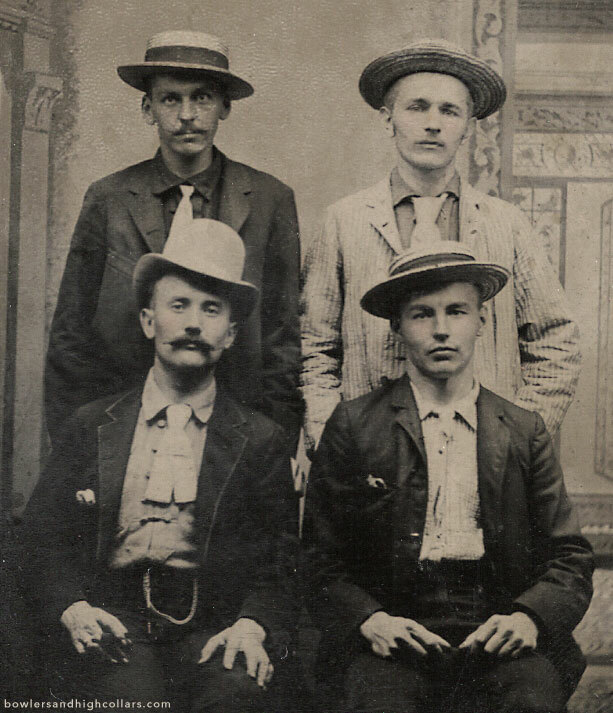 This entry was posted on Sunday, July 12th, 2015 at 8:56 am	and tagged with 1/6th plate, 1880s, bowler, brothers, menswear, mustache, siblings, straw boater hat, twins, victorian and posted in Groups, Tintypes. You can follow any responses to this entry through the RSS 2.0 feed.